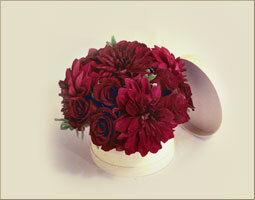 Deep burgundy flowers in a pave style design, featured in a wooden hand crafted hat box. We creatively fill a hat box with flowers, and make unique rose arrangements of floral hat boxes. We guarantee prompt red rose hat box delivery in Beverly Hills, West Hollywood, Santa Monica and greater Los Angeles area.